We shall try to get in a few more items before we are too busy. At 5:50 am we boarded the 166 for Haifa and with some help, after the bus went by our stop, made it back to the Lev Ha Mifrats train station. Our fears were confirmed that the train (13 minutes) to Ben Gurion Airport was not running, and was replaced by a 45 min shuttle bus. We were sure that we would miss Will at the airport. We boarded the train to Savidor Center in Tel Aviv, expecting some kind of sign to the shuttle bus that we could understand, but it was all a mystery. We did find it eventually, and when it filled (ten minutes ahead of schedule) it left. We arrived close to 9 am, and found that Will's plane was a few minutes late. We had time to buy minutes for his cell phone, visit the toilet. Will arrived a few minutes later and then with some efficiency we returned to Tel Aviv. 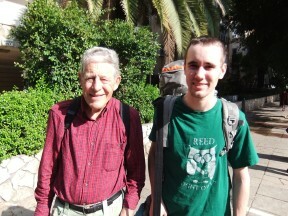 We had made plans to meet with Amos Gvirtz, a long-time peace activist and colleague of Adam Keller and Jeff Halper. 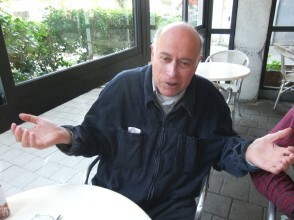 We met at the Henrietta Cafe, right by the Savidor Center, and he gave us a clearly-planned lecture on how the history of Israel fits into the current negotiations. He divided Israeli Zionists into two groups - the existentialists and the zealots. He saw little hope for the latter, and little hope for the country if they gained control. 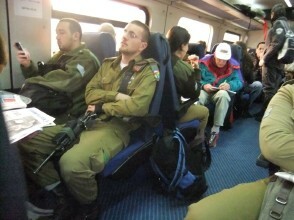 He pointed out that Israel, a small country in often unfriendly surroundings, always needs the help of a super power. Back in the Suez Crisis days it was France, but since the 1967 war it has been the United States. Israel will only compromise when Super Power support is in jeopardy. In 1979 Israel gave up Sinai not out of kindness but because Carter was willing to put US Support on the table as part of the bargain. Amos used the last bit of time he had with us promoting BDS (boycott, Divest, Sanction), emphasizing that only this kind of campaign has a chance of undermining Israel's support by the US and other major powers. Amos promised to send us some of the short papers that he has been writing, and he has been true to his word. 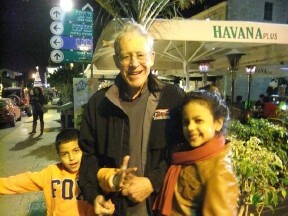 Here are links to three that I think are particularly significant: "Understanding War", "An Open Letter to President Obama", and "Another Acre Another Goat"
We took the number 10 bus to Old Jaffa, being a little uncertain as to where to get off. There were a couple of "foot-loose youth" sitting with their guitars across the aisle, and it was apparent that they were going to the same place. First I asked the driver and he said "Yafo Sha-on". When I looked puzzled he said "Clock", and went back to driving. I asked the FY's and they said "Follow us". The bus wound through the comfortable-looking neighborhoods along the sea shore, and then we saw something unusual - a very large crowd of African men moving northwards along the side walks and spilling into the streets. 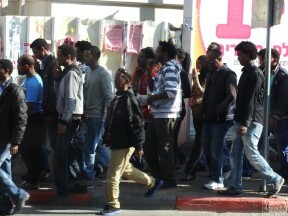 This was the second day of demonstrations by mainly Eritreans and Sudanese who have entered Israel as refugees. Many liberal Israelis support them, but the conservative the government calls them migrants and infiltrators. In fact Former interior minister Eli Yishai said that the government should take advantage of the migrants’ mass protests to round them up and deport them. “The State of Israel must act with unshakable motivation in the face of the danger of becoming a state of infiltrators, and there is no other solution than to to put every single one of the infiltrators in detention facilities, take their work permits, put them on airplanes and send them packing to their countries or a third country,” That may be a formidable task, since there were 10 - 20 thousand participants at the demonstrations. 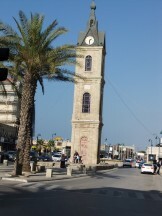 which I could recognize as Yafo, or Jaffa, and we were approaching the clock tower pictured above. The FY's gathered up their guitars. We passed the tower and there were about 20 young people sitting in front of it sort of hanging out, and there were plenty more like them walking up and down the streets. It took me back 45 years. The guitar-players were kind enough to walk with us through the flea market, and pointed out a three-story square building that seemed to take up half a block. "That's the Old Jaffa Hostel, but the entry is on the other side". We thanked them, and walked around to the door. Will made it clear that he didn't need our help, so we left him there - we probably were being too over-protective of our 20-year-old grandson. That's how grandparents are, I guess. 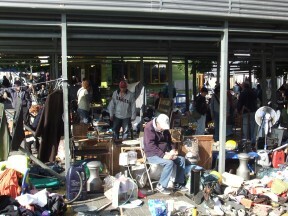 We were feeling a little pressed for time, and were just making our way through the Flea Market when we passed a carpet dealer. 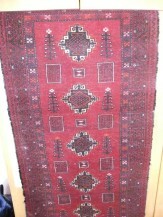 On the sidewalk in front of the store was a small, tighly-knotted red carpet, that was clearly Nomad and perhaps Iranian. Sadly, Sam fell in love with it, and we did buy it, after appropriate haggling, for an undisclosed sum. The entire transaction was classic, even if the dealer was Jewish. Maybe the carpet is a jewel - maybe it is a throw-away. I (Sam) only hope that it does not cause any marital friction in the future. We left the shop and managed to find the bus back to Savidor. Again we had to pass through security at the train station, but the agent waved us through saying she remembered us from the knife incident in Haifa At the ticket window we fidgeted in line for an extra five minutes while a very proper Scottish man worked out, with the aid of a partially bilingual interpreter, his ticket with a decidedly mono-lingual clerk. 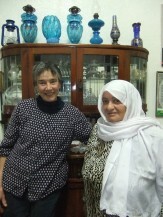 When we asked for two tickets to Lev Ha Mifrats, she paused and asked us about taking a bus. ("Just give us the tickets", I thought.) We rushed to the platform only to see the Nahariya Express leave as we went down the escalator. We caught the next one, knowing that this might mean missing the 166 to Ibillin. Getting home suggested a conspiracy like the one encountered by Cary Grant in "North by Northwest". We could not tell if we had missed the last 166, so we embarked on the 167 to Shefaram, along with two others going to Ibilin. We did want to see if the transfers worked. Just after the bus made the decisive turn to Shefaram, it stopped, and the driver sent a person back to tell us "This is your stop". We looked around and noted that the other Ibillin passengers had disappeared. We also knew that we were five miles from Shefaram, and not much closer to Ibillin. We tried to explain that we could transfer to the 343 or walk from Shefaram, but everyone on the bus was insistent - "This is your stop, just get off and walk that way". We had no choice. It was dark, and this was not a scheduled stop. We disembarked, and began walking "That way", watching another bus (was it the 166?) pass by and take the turn to Ibillin. There was a young woman standing on the sidewalk. She seemed to be expecting us. "I will help you" she said, and we followed her around the corner. There was a car waiting. She said "Please get in, this is my father". They dropped us off at the traffic circle in front of the schools. Was it a conspiracy? 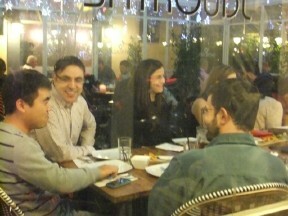 Amos had suggested that we talk with a man in Shefaram name Elias Jabbour, who lived at 60 Jabbour Street. We called him the next morning, and he offered to pick us up, but we thought we knew where Jabbour Street was and siad we would walk the mile or so to his house. 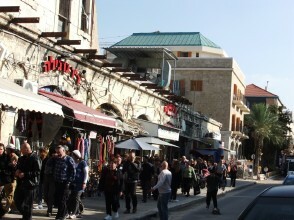 We walked to the old city and discovered no street signs that said Jabbour Street, so we asked. As is also the case in New England, there are no signs for the street that you are on, and that was Jabbour Street. We asked where "60" was and he gave me a puzzled look, then he said "Don't ask for a number, just ask for Elias". That worked pretty well until we approached the house, since it had no number, and didn't talk. A dignified man drove up beside us. That was Elias, who assumed that we were in the neighborhood but lost. 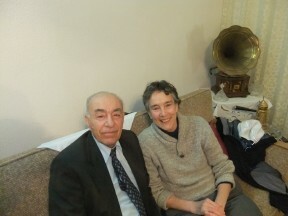 He invited us into his house, which was where he was born in 1935. He started the same way that Amos had started, saying that you can't understand Israel without knowing the history; however his context was more subjective than Amos'. He was 13 in 1948 and remembers the events well. His father, the Mayor of Shfa'Amr (the Arabic name), had to allow the Israeli army the use of his house as the administrative center as they "conquered" the city. Over the next 18 years the city remained under military occupation and 70 percent of its land was confiscated. That is what Wikipedia says. Elias says that he lived in this house all his life. Elias was quite clear that there will be no peace without justice, and there will be no justice when one set of citizens is treated differently from another set. He said "We can live with each other, but we can't live on the same land without each other". He felt strongly that the growing Israeli settlements scuttle the prospects for a just solution, and considered the small, gated Jewish communities in Eastern Galilee to be just another set of settlements. Elias is a strongly committed Christian, who believes in all parts of the bible. He says that Isaac (Jews), Esau (Palestinians) and Ishmael (Arabs) are all descendants of of Abraham, and when God gave the land of Israel to Abraham, he gave it to his entire family. God also gave the land on the basis that its inhabitants follow the law, and that is the issue today. 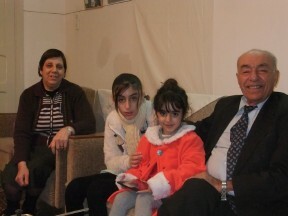 Late on Tuesday we received a call from Amana, the mother of Aseel, who had promised some day to show us Haifa. 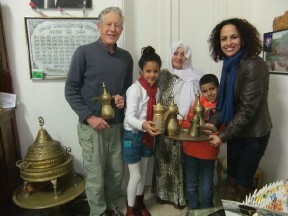 Amana teaches Hebrew at the High School, and Aseel is writing pen-pal letters and has danced with the sixth graders. We first traveled to her "grandmother's" house. Well, it is complicated. The person she calls her grandmother was her great-grandfather's third wife, Fatma, married at 20. 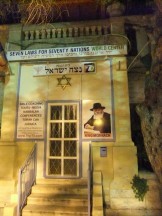 He died 55 years ago, and she has lived in this house in Haifa ever since. 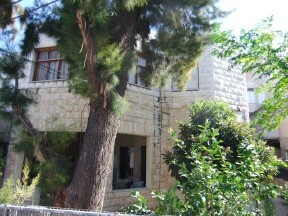 The house is typically Palestinian Arab, with three floors and nice balconies looking out on the harbor. Inside were various pieces of furniture and artifacts dating to Ottoman times, on glazed tile floors. Ada lives on the third floor and rents the other two. Amana seemed concerned that renter protection laws in Israel are very strict, and put severe limits on eviction after a certain time. Amana thinks that this nearly gives renters inheritance rights, and it is a means for Jewish people to obtain formerly Palestinian houses - I'll need to check that out. We drank tea and ate sweets with Ada and the family, and then the five of us (including Bian a nephew from Ibillin) saw some of the sights. It was after 9 pm, and the streets were mostly quiet. We went to a nearby business district which is very busy in the daytime, but all the restaurants were closed except for McDonald's, where Ruth and I had something like two Big Mac Juniors and 1 fries for 58 NIS, or around $16. Not as high as gasoline! 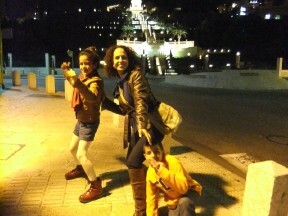 We went on to Ben Gurion Street, right at the base of the Bahai Gardens. There all the restaurants were open, with "Barkers" on the street encouraging you to enter. By the looks of the decor I would say that they would be much more expensive than McDonalds. We walked one side and down the other, taking pictures of what we saw. As we walked down the street Amana had us take note of a Jewish religious center in a formerly Arab building, and an international team of medical researchers having dessert together in one of the retaurants. The leader, facing on the left, is a famous cancer specialist. 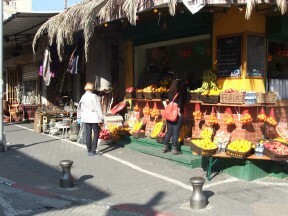 I made an off-hand mention as we left Ibillin that I had met a person from Mitspe Aviv at a pharmacy nearby. She replied, "Yes, they come here for medicine, fresh fruit and vegetables, auto repairs - all sorts of things and the relations are good. There is no problem with people getting together - just with the government.". She later added, "It is all right to live together, but not under laws that treat people differently".